This is our rally cry. My friends and I, doing that thing that basically everybody who blows through Boston does, would live in tiny little apartments in Allston or Brighton, and in our anti-cell phone way, when we wanted to get each other's attention, we would approach the other person's window, and yell "Chhhooowwwwdddaaah!" Nine out of ten times, the rally cry would be returned, and then we'd all go to the nearest dive and get effed up. True story. So the recipe that I'm about to prepare is that of The New England Clam Shack Cookbook by Brooke Dojny. It's an excellent cook book, compiling some of the greatest hits of various clam shacks in New England. 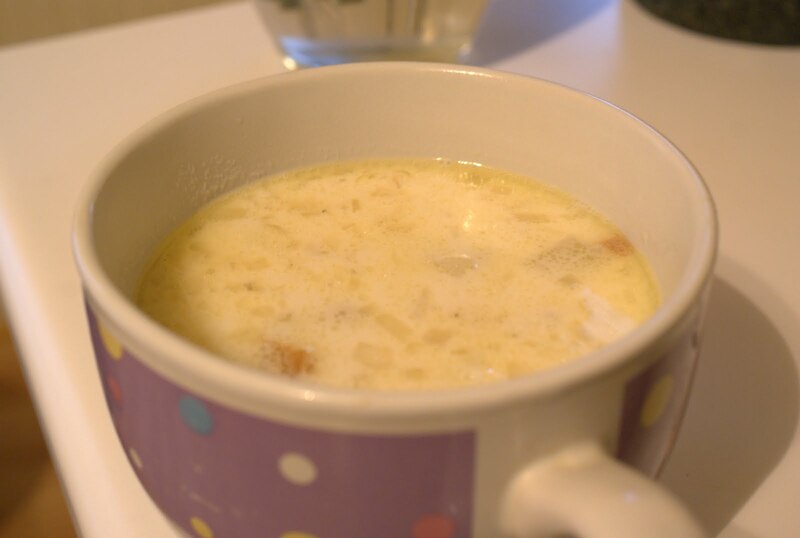 This particular recipe is called "Nana's Haddock Chowder" and is an adaptation from a haddock chowder served at J.T. Farnham's in Essex, Massachusetts. You may recognize the name of this institution, because it was featured by that spiky-haired weirdo, Guy Fieri on Diners, Drive Ins and Dives. At any rate, this place existed long before the show did, and has only grown in popularity because of it. Located right on the marsh, it's a great place to grab the fish chowder and some fried clams, though I'm a bit adverse to the crowds of people that have showed up since the television program. Credit given where credit is due. But what of my version of the recipe? I've made this recipe verbatim in the past, and found that it wasn't quite developed enough. It was super easy, and I thought pretty good, but the seafood essence was just too understated for my liking. Therefore, I will be making my own adaptations. 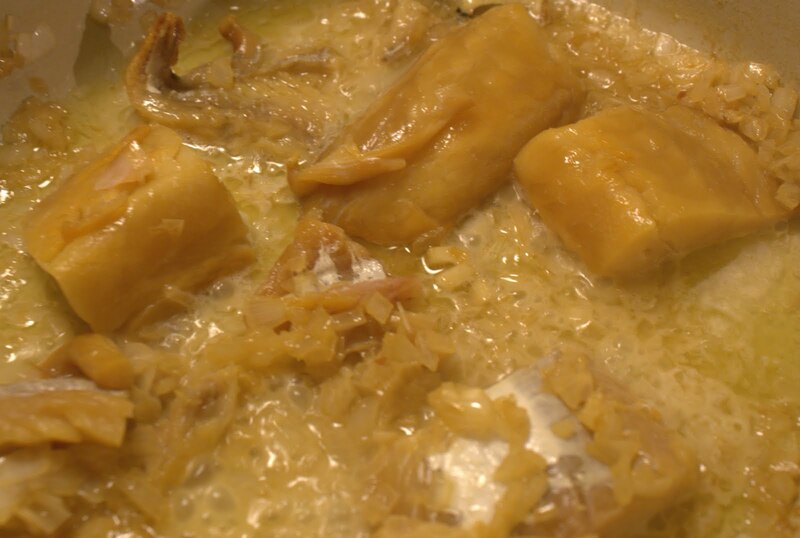 First, instead of the addition of water which the recipe normally calls for, I am adding my previously prepared fish stock (see entry fish stock). Also, instead of just plain normal haddock, as the recipe calls for, I am going to be using a smoked haddock, available in the freezer at Rowand Fisheries in Beverly, MA. I am also adding the meat of a pound of littleneck clams, the juice of which was also used for the fish stock, and the meat will add an additional flavor to the chowder. Oh, and last of all, you'll see a variation in quantities, because I'm only making half of the amount specified by the recipe... sadly, I am dining alone tonight as the big one is at work, doing a double shift... still, this recipe should produce about 4 main course servings of chowder, if you're keeping score. So, now you're up on all the history, and how much I love chowder. It's time we get started. 2) Prep some veggies. There's not too many to go into this. Finely dice about 3/4 cup of onion. 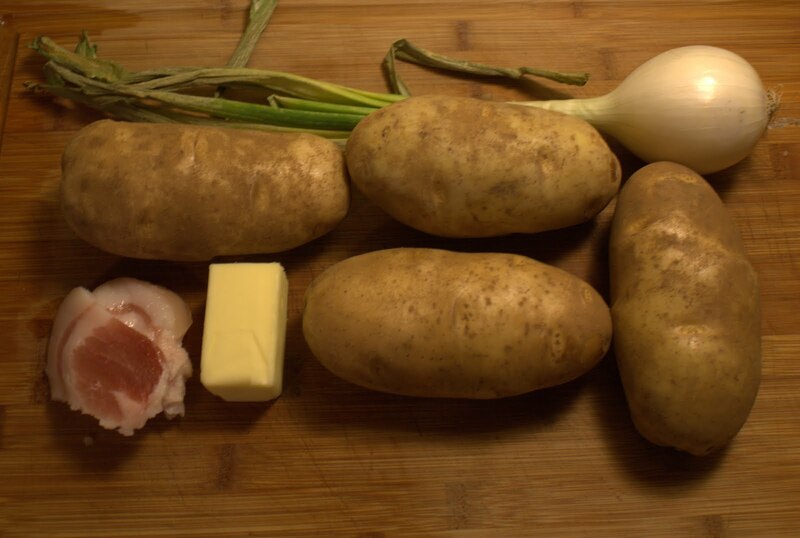 Also take this time to peel up your potatoes. I like to use run of the mill russets. You should have about four cups of peeled and diced potatoes for this recipe. 3) Dice up about 1/8 of a pound of salt pork. A little bit goes a long way. Throw these into a dutch oven on low heat until the pieces are nice and crispy. Remove with a slotted spoon, leaving the fat in the pan. 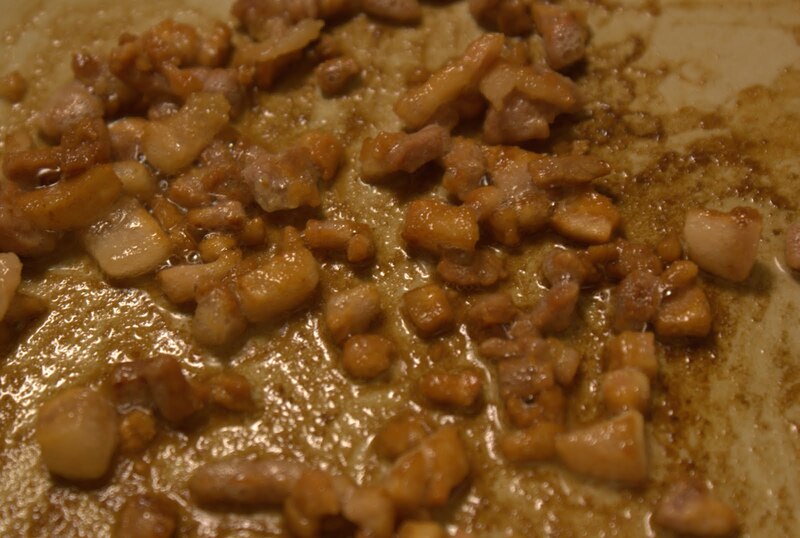 Add about a 1/2 stick of butter to melt with the salted pork drippings. 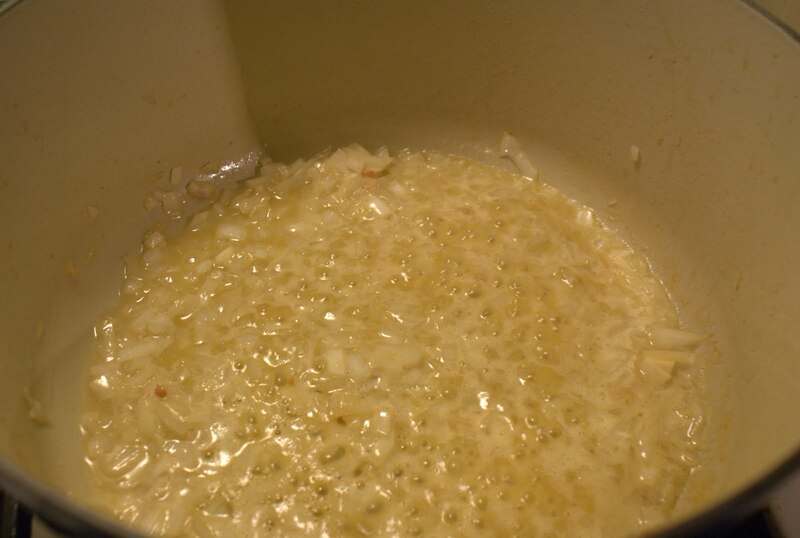 4) Add your onions to the fat, and allow to cook for approximately five to ten minutes, or until slightly softened, but not browned and caramelized. 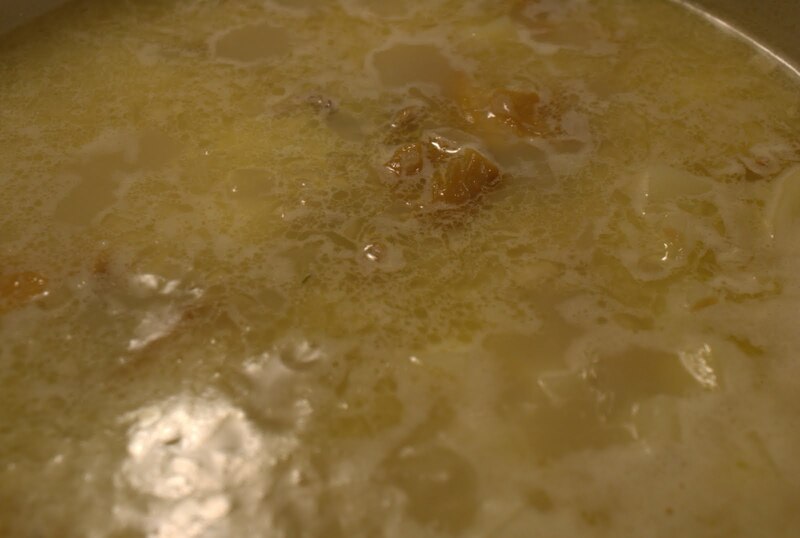 Stir frequently throughout, because you don't want burned onion pieces in your chowder. 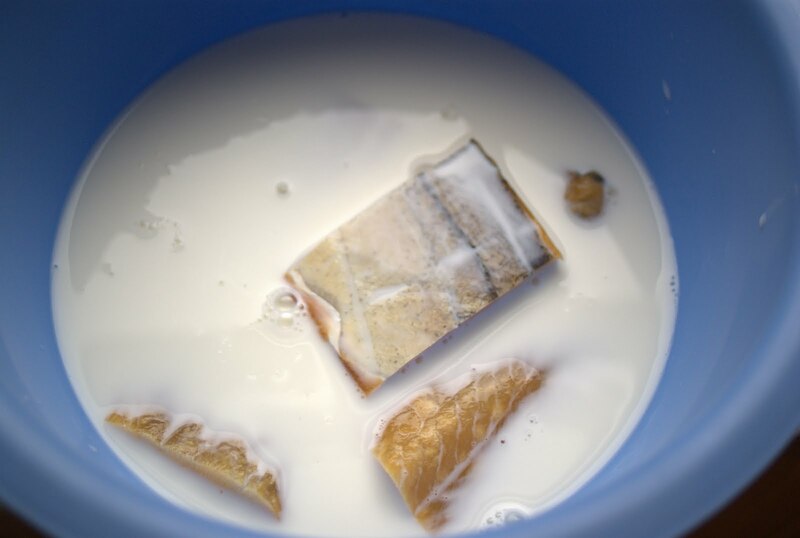 6) Add your smoked haddock flavored milk to the pot. When everything is warmed to your liking, add salt and pepper to taste. Oh, and now's also an appropriate time to add the meat from the littlenecks that you had used to make the stock to the chowder. Chop each littleneck into quarters, and throw them in. When they are warmed through, as is the milk, you are ready. There you have it. A New England fish chowder, complete with smoked haddock and bits of littleneck clam. Note: This recipe is always more flavorful if you prepare while watching Jaws... best movie ever made. You'll probably be ready to eat sometime around when Quint goes into his famous speech re: the USS Indianapolis. Sometimes that shark looks right into ya. Right into your eyes. And the thing about a shark is he's got lifeless eyes. Black eyes. Like a doll's eyes.